Barthes, R. (2000). Mythologies. Moscow: Izd-vo im. Sabashnikovykh. Baudrillard, J. (1995). The System of Objects. Moscow: Rudomino. Baudrillard, J. (2000). Symbolic Exchange and Death. Moscow: Dobrosvet. Foucault, M. (1994). Nietzsche, Freud, Marx. Kentavr, 2. Genisaretsky, O. I. (2000, November). Voobrazhaemaya predmetnost’ i voobrazhaemaya deyatelnost’: k pedagogike voobrazheniya [Imaginative Objectivity and Imaginative Activity: to Imagination Pedagogics]. Kentavr, 24, 53-58. Glazychev, V. L. (1986). Kompozitsiya kak myslitelnaya deyatelnost' (k postanovke problemy) [Composition as Thinking: to the Articulation of the Problem]. In L. I. Kirillova (Ed. ), Teoriya kompositsii v sovetskoi arkhitekture (pp. 213-225). Moscow: Stroiizdat. Goel, V., & Pirolli, P. (1992). The Structure of Design Problem Spaces. Cognitive Science, 16, 395–429. Goldschmidt, G., & Tatsa, D. (2005, November). How good are good ideas? Correlates of design creativity. Design Studies, 26 (6), 593–611. Hardy, Holzman & Pfeiffer. (1971). L’Architecture d’Aujourd’hui, 5, 47-48. Jencks, Ch. (1985). The Language of Post-Modern Architecture. Moscow: Stroiizdat. Kapustin, P. V. (2012a). Proektnoe myshlenie i arkhitekturnoe soznanie. Kriticheskoe vvedenie v ontologiyu i fenomenologiyu arkhitekturnogo proektirovaniya [Design Thinking and the Architectural Consciousness. Critical Introduction to Ontology and Phenomenology of Architectural Design]. Saarbrucken, Germany: Lambert Academic Publishing. Kapustin, P. V. (2013a). Intuitsiya i model’. Myshlenie arkhitektora ot remesla k professii [Intuition and Model. Thinking of an Architect from Crafts to Profession]. In I. A. Dobritsyna (Ed. ), Voprosy teorii arkhitektury: Arkhitektura v dialoge s chelovekom (pp. 305-314). Moscow: LENAND. Kapustin, P. V. (2013b). O meste vizionerstva v evolyutsii akhitekturnogo proektirovaniya [On the Place of Visionarism in the Evolution of Architectural Design]. Arkhitekturnoe Interprostranstvo XXI Veka: Opyt, Problemy, Perspektivy. Proceedings of the International Scientific and methodological conference. Saint Petersburg: Izd-vo SPbGASU. Kapustin, P. V. (2018b). Mezhdu molchaniem znakov i gulom yazyka. Sudba arkhitekturnogo kontseptualisma [Between the Silence of Signs and the Hum of the Language. The Destiny of Architectural Conceptualism]. Architecture and Construction in Russia, 1 (225), 46-53. Krinsky, V. F., Lamtsov, I. V., & Turkus, M. A. (1968). Elementy arkhitekturno-prostranstvennoi kompozitsii [Elements of Architectural Space Composition]. Moscow: Izd-vo lit. po stroitelstvu. Norberg-Schulz, Chr. (1965). Intentions in architecture. MIT Press. Ryklin, M. (2002). Nevynosimost’ nepredstavimogo. Beseda s Jean-Luke Nancy [Unbearable Unimagined. Conversation with Jean-Luke Nancy]. In Deconstruction and Destruction. Conversations with Philosophers (pp. 100-123). Moscow: Logos. Vaneyan, S. S. (2004). Intentsiya, ekzistentsiya i genii mesta [Intention, existence and genius loci]. Iskusstvoznanie, 2, 356-375. Venturi, R. Scott Brown, D., & Izenour, S. (2015). Learning from Las Vegas: The Forgotten Symbolism of Architectural Form. Moscow: Strelka Press. Vipper, B. R. (1985). Vvedenie v istoricheskoe izuchenie isskusstva [Introduction to Historical Studies of Art]. Moscow: Izobrazitelnoe iskusstvo. KAPUSTIN, Petr. A Century of Total Reduction. 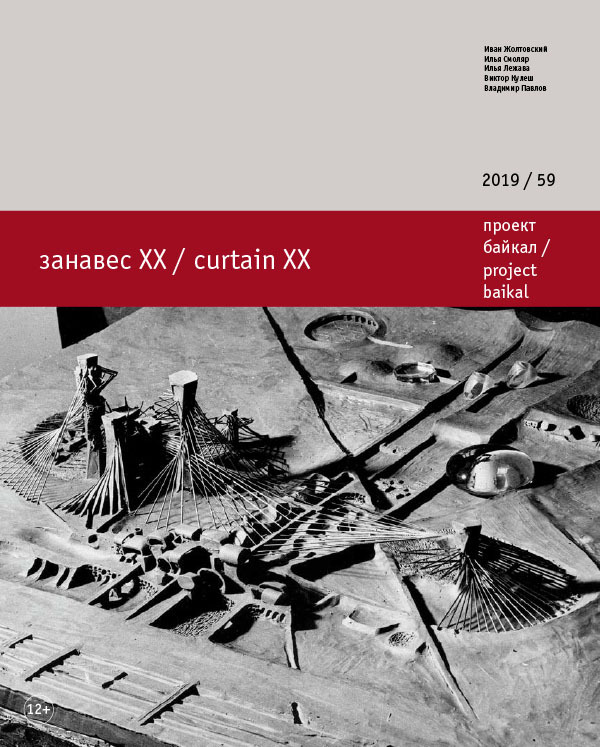 project baikal, Russian Federation, n. 59, p. 32-39, mar. 2019. ISSN 2309-3072. Available at: <http://www.projectbaikal.com/index.php/pb/article/view/1428>. Date accessed: 22 apr. 2019.